Companies need meaningful insight into how vulnerable they are to expanding and evolving digital risks. 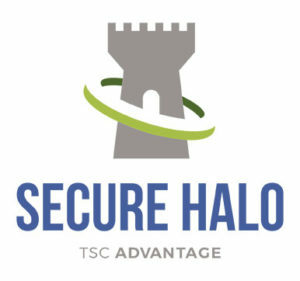 The Secure Halo™ platform by TSC Advantage provides a holistic view of cyber risk, including from leading threat vectors like insider threat and third-party dependencies, to empower market-driven and threat-based decisions while also meeting regulatory requirements. Secure Halo™ efficiently analyzes, aggregates, and benchmarks cyber risk in a user-friendly, online format that puts enterprise security assessment results and prioritized recommendations at your fingertips. Scalable to business size and need, it provides in-depth views of risk by individual security control and across a portfolio of clients or vendors. It’s a powerful decision-making tool for company leaders who wish to align security investments with business objectives. 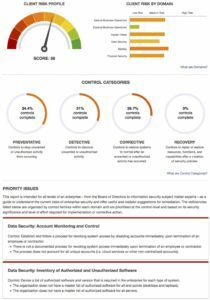 Secure Halo™ reduces security concerns related to the sharing of sensitive information during due diligence and assessment. It houses client data within a secure platform, ensuring client confidentiality while mitigating the risk and liability of compromise. Scroll to see how Secure Halo helps cyber insurance underwriters, risk managers, and executives make more strategic business decisions. The demand for cyber insurance continues to grow, yet assessing and quantifying cyber risk remains a challenge for insurers. While web-based passive scanning solutions offer an external view of company risk, they also obscure the significant threats due to insiders with authorized access, weak security policies and procedures, and third party exposures. The Secure Halo™ platform answers insurers’ need for both efficiency and depth when making underwriting decisions. Secure Halo™ streamlines the insurance application and assessment process through a non-intrusive, online assessment. At the same time, it identifies cyber risk across six critical business domains, providing a holistic view of security posture and prioritized recommendations for improvement. To secure your enterprise in today’s outsourced business environment, you must understand and protect your entire digital ecosystem. Increasingly, threat actors are using third parties with access to business-critical information to work around internal security solutions. Secure Halo™ provides an efficient, non-invasive, and cost-effective way to measure and align security controls used by third party vendors or suppliers. Using Secure Halo™, you can identify specific weaknesses, inform vendors, and set contractual cybersecurity standards. The financial industry is a prime target for cyber attackers, making cybersecurity and cyber risk management tools a must for financial services executives. Secure Halo™ improves financial organizations’ ability to meet increased demands including regulatory requirements, while also strengthening your competitive advantage through improved security, and provides due diligence for more informed investments and greater portfolio performance. Government agencies and contractors who support them are required to meet increasingly strict cybersecurity regulations, like DFARS, FedRAMP, and NIST SP 800-171 among others. Additionally, cyber actors not only have the innovative capacity of U.S. companies in their cross-hairs, but also similarly strive to erode our national security advantage. While defense agencies invest heavily in perimeter safeguards, “insider” accesses held by vendors warrant equal attention and governance. Untreated, non-critical access may evolve into systemic risks, giving way to high risks outcomes, including data manipulation, espionage and disruption of critical systems. TSC Advantage believes in empowering federal agencies to find, fix and protect their vital assets using scalable methods and tools and can help meet cybersecurity requirements.